Attack on Titan (進撃の巨人, Shingeki no Kyojin) is a 2015 Japanese post-apocalyptic action horror film based on the manga of the same name by Hajime Isayama. The film is directed by Shinji Higuchi, written by Yūsuke Watanabe and Tomohiro Machiyama and stars Haruma Miura, Hiroki Hasegawa, Kiko Mizuhara, Kanata Hongō, Takahiro Miura, Nanami Sakuraba, Satoru Matsuo, Shu Watanabe, Ayame Misaki, Rina Takeda, Satomi Ishihara, Pierre Taki and Jun Kunimura. In Attack on Titan Eren Yeager, his adoptive sister Mikasa Ackerman and his childhood friend Armin Arlert, join the Survey Corps, a military corporation to fight gigantic humanoids called the Titans after their hometown is attacked by a Colossal Titan. The film is split into two parts, with the first part released in Japan on 1 August 2015 and the second part (subtitled End of the World) released on 19 September 2015. One hundred years ago, the Titans suddenly appeared and decimated most of humanity. To stop their advance, humanity built a series of walls and lived peacefully there for another 100 years. In the present day village of Monzen, Eren expresses to his friends, Armin and Mikasa, his desire to leave the confines of the Outer Wall and see the outside world. After their failed attempt to approach the wall, Souda, the captain of the Garrison, explains to them that the military is assembling a scouting regiment to explore beyond the walls. However, the wall is suddenly attacked by the Colossal Titan. The wall is breached and Titans enter the village, eating people and getting back up despite being injured. When Mikasa tries to rescue a baby, she is separated from Eren, and is presumed killed. Two years later, Eren and Armin enter the Scout Regiment, along with Sasha, Jean, and others. The team, led by Military Police Commander: Kubal, move out into one of the towns of the Outer Wall. The group is then attacked by Titans but are saved by Captain Shikishima and Mikasa, who survived the attack from two years ago and is now part of the Scouts. Eren eventually confronts Mikasa and she reveals to him that the experience made her realize the world is cruel. After realizing that Mikasa and Shikishima are most likely together, Eren is once again devastated. When more Titans surprise them, Kubal retreats, leaving the Scouts to fend for themselves. Lil, who had just lost her lover, sacrifices herself. Jean attempts to convince Eren to flee, but Eren chooses to fight back before losing his leg in the process. Eren manages to save Armin from being eaten but at the cost of his own life. Though crushed by Eren's death, Mikasa keeps fighting until she runs low on fuel and comes face to face with the same Titan that ate Eren. However, a Titan emerges from within it and begins battling the other Titans. Souda and Mikasa realize that the Titan is Eren. After he starts to collapse, Mikasa frees Eren from his Titan shell. Years before, a young Eren is forcibly injected with an experimental serum by his father, but soon after Eren's mother discovers this, a military police squad break in, taking Eren's parents and burning the place. Eren survives with the help of Souda. In the present, Eren is captured by Kubal and his squadron, believing he is a threat to humanity. Armin and Souda try to persuade Kubal to spare Eren's life, but Souda is killed. Before Eren is executed, a Titan busts in, killing Kubal and his squadron, takes Eren, but spares Mikasa and her comrades. Eren awakens in a mysterious bunker with Shikishima, who reveals the origins of the Titans as a military experiment gone wrong that soon developed into a virus that turned people into Titans and decimated humanity. Shikishima plans to launch a coup against the corrupted government who has been oppressing its people with the walls and with fear of the Titans. Eren learns that Shikishima has stockpiled some of the pre-Titan War weapons, and agrees to help. Hange, Mikasa and the others retrieve a undetonated bomb in Eren's hometown with the hopes of using it to seal the outer wall. They encounter Shikishima's troops and reunite with Eren. However, Shikishima attempts to recruit them into his coup, revealing that he plans to use the dud bomb not to seal the wall but to blow up the capital and let the Titans overtake everything, freeing humanity. Realizing that more innocent lives would be shed, Eren stands against Shikishima. As they fight, Sannagi sacrifices himself to bring down a nearby tower that falls on the weapon stockpile, blowing it up while the others escape with the bomb. However, Shikishima reappears on the truck and stabs himself revealing himself to be the Titan that took Eren earlier. The gang attack Shikishima, who smashes Eren into a wall, but Eren transforms into his Titan form and defeats Shikishima. Titan Eren climbs the wall and plants the bomb, reverting to his human form while Armin sets the fuse. Having survived the earlier attack, Kubal wants the group to give up Eren and return to the interior, but they refuse. Kubal shoots Armin, but is shot by Sasha and falls, transofrming into the Colossal Titan. When Eren, Mikasa and Jean try to jump on the Colossal Titan's back, Jean is killed. The bomb does not go off, so Mikasa tries to get the bomb fuse working again, but is confronted by Shikishima. Eren tries to break into Colossal Titan's nape but is knocked down. Shikishima sacrifices himself by transforming into a Titan and lodging the bomb into the Colossal Titan's mouth. The detonation successfully closes the hole in the wall and Eren and Mikasa stand at the top of the wall overlooking the ocean. In a post-credits scene, footage of the battle with the Colossal Titan is analyzed, in Shikishima's bunker, by an off-screen character, who says that Eren and Mikasa's unpredictability is what makes them "fascinating". 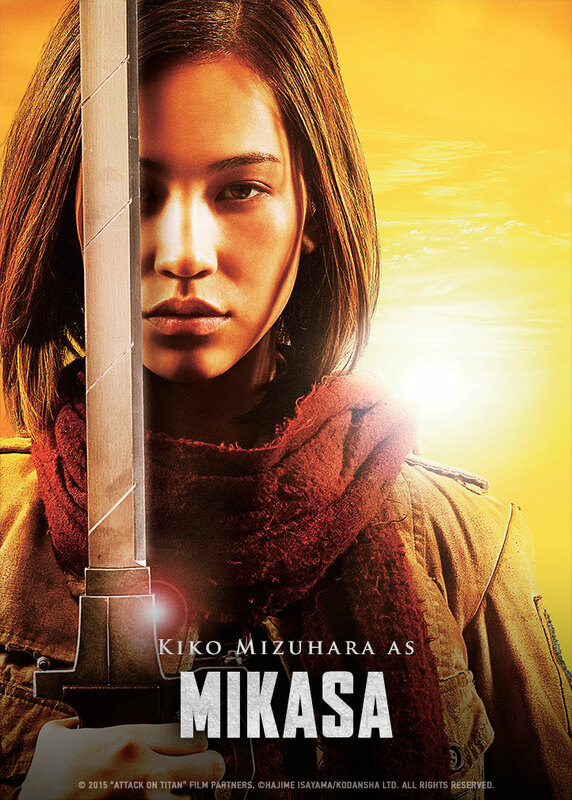 Kiko Mizuhara as Mikasa, Eren's childhood friend. It was thought that she had been killed in the initial wall breach at Monzen, but she reappears as part of the Scout Regiment under Shikishima. 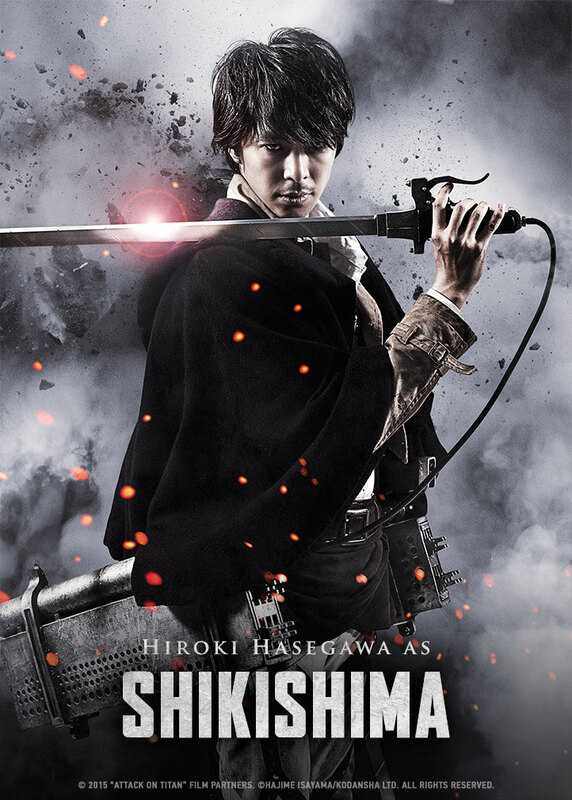 Hiroki Hasegawa as Shikishima, the captain of the Scout Regiment. Kanata Hongō as Armin, Eren's childhood friend. He has an interest in mechanical stuff. 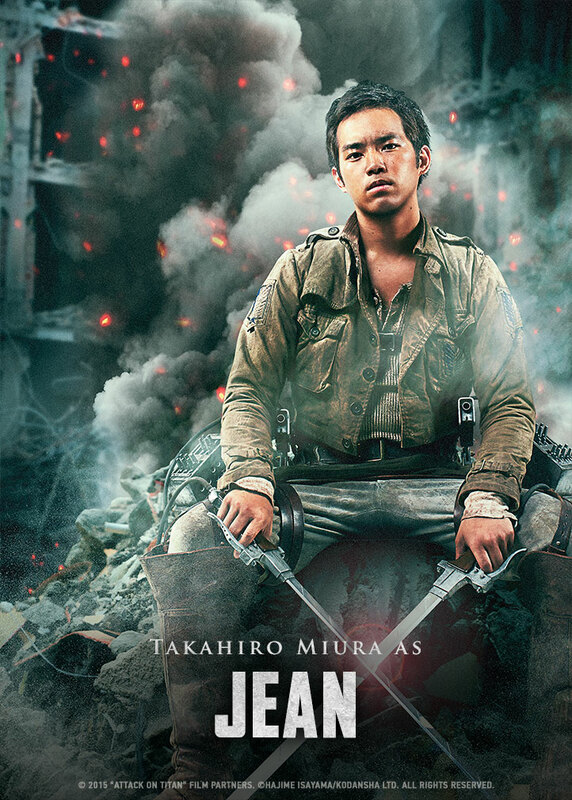 Takahiro Miura as Jean, a soldier who gets into a scuffle with Eren. Nanami Sakuraba as Sasha, a soldier who enjoys food, especially potatoes. She uses a long bow. 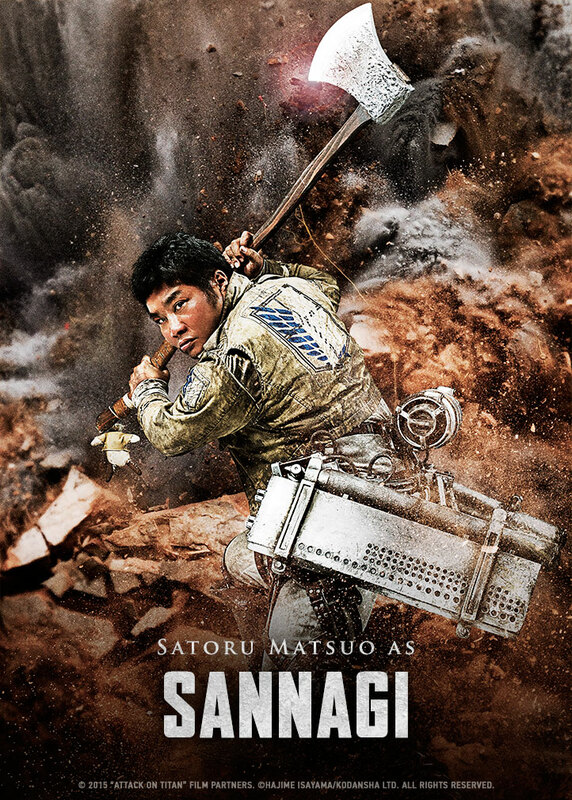 Satoru Matsuo as Sannagi, a soldier who uses an axe where he cuts the heels of the Titans. 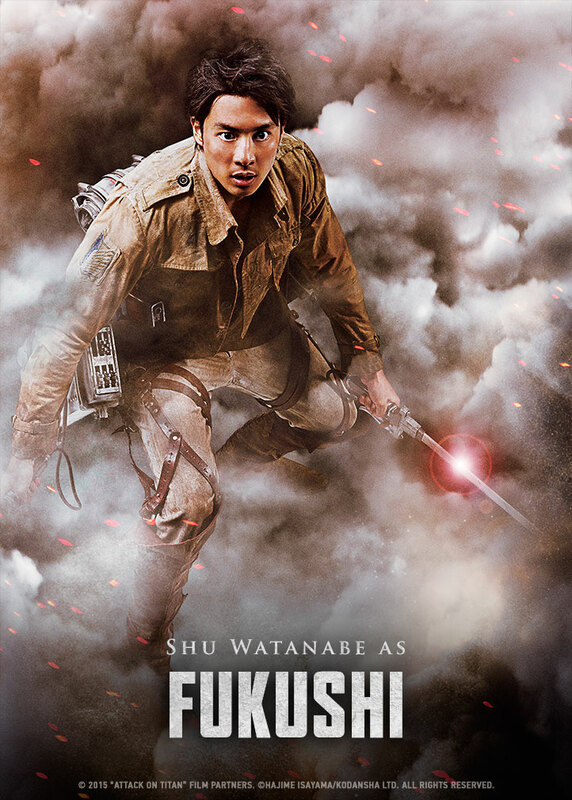 Shu Watanabe as Fukushi, one of the soldiers. Ayame Misaki as Hiana, one of the female soldiers. It is later revealed she joined the Scouts in order to provide for her daughter. Later, she is eaten by a titan. Rina Takeda as Lil, one of the female soldiers, she and another soldier are a couple. Pierre Taki as Souda, a former captain in the Garrison when the walls are breached at Monzen. Satomi Ishihara as Hans, the weapons chief and a leader in the Scout Regiment. She typically wears goggles and first appears where she demonstrates the omni-directional mobility gear. 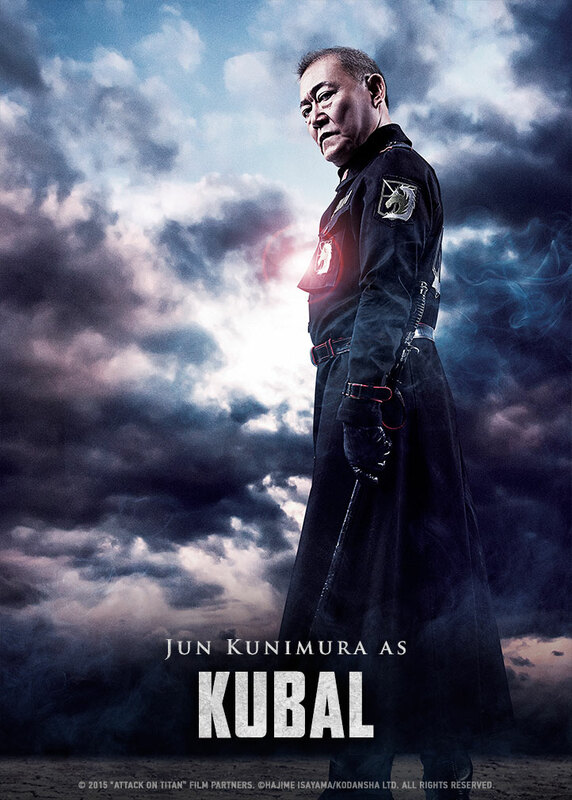 Jun Kunimura as Kubal, the director in the military forces. Some characters that were featured in the original manga and anime were dropped due to the film's setting having been changed from Germany to Japan. The character voices for the Funimation English dub are the same as those in the anime. The film was announced on October 2011, with a planned release date in 2013 and in December of the same year it was announced that it would be a live action film and that Tetsuya Nakashima would direct. On December 2012 it was announced that Nakashima had left as director because of creative differences. On December 2013, Shinji Higuchi was revealed as the new director and Yuusuke Watanabe as the screenwriter. Originally, the filmmakers wanted to make the film very faithful to the source material, but author Hajime Isayama suggested numerous changes (such as introducing new and different characters, and changing the setting to Japan) to make the films standalone, because "the story has already been told", while also introducing new elements that would later be used in the manga. Another thing to note is that the films may or may not be a sequel to the 1966 Toho film, The War of the Gargantuas. Principal photography was expected to start in 2014 and the film was now expected to be released in 2015. A car commercial featuring the Titans and directed by Higuchi was also announced and broadcast on January 2014 on Nippon TV, reaching more than 5 million views on YouTube in four days. Haruma Miura was revealed as part of the cast in April and in July it was announced that there would be two films. The first images of the actors in character were revealed in November. Shirō Sagisu composed and scored an original motion-picture soundtrack, which compiled into one whole soundtrack. The theme songs of the films are "Anti-Hero" and "SOS", respectively, both performed by Sekai no Owari. The film's soundtrack goes under the name "Attack on Titan (Shinji Higuchi's Original Motion Picture Soundtrack)". The first film was released in Japan on 1 August 2015. It was released by Madman Entertainment in Australia and New Zealand on 27 August 2015. Funimation Entertainment has licensed the rights for both films in North America, Central America, and South America and hosted the world premiere of the first film on 14 July at Grauman's Egyptian Theatre in Los Angeles, California. Director Shinji Higuchi and stars Haruma Miura and Kiko Mizuhara attended the red carpet premiere. Funimation had announced its screening dates for the films. Attack on Titan: Part 1 screened in a limited engagement beginning on 30 September 2015 and Attack on Titan: Part 2 screened three weeks later on 20 October 2015. The second part, entitled End of the World, was released on 19 September 2015. It was released on 1–7 October for Australia and New Zealand. The second film did poorly at the japanese box office, relative to the first part - the first film made $4.8 million in its opening week at the Japanese box office, and the second did $2.7 million. For its DVD and Blu-ray release in the United States, which included English dubs of both films, Part 1 was released on 4 October 2016 and Part 2 released on 6 December 2016. A teaser trailer was released in March 2015 and a trailer was released in April. Another trailer was released in June, which revealed that the film will be given an IMAX release in Japan and internationally. Part I was number-one on its opening weekend, with US$5.1 million. It was the seventh highest-grossing Japanese made film at the Japanese box office in 2015, with ¥3.25 billion (US$27 million). and the 17th highest-grossing film at the Japanese box office for that year. Part II underperformed at the box-office, having grossed ¥2.1 billion less than the total gross of the first film within first three weeks of release. Combined, the films have grossed ¥4.93 billion ($46 million). Lee Edmund of South China Morning Post, said that the film was "One of the most perversely original fantasy movies in recent memory, this adaptation of a Japanese manga series is a schizophrenic mix of genres." Hope Chapman of Anime News Network also praised the movie. "Outstanding and immersive aesthetic unlike any other horror movie, swiftly paced and gripping start to finish, sharp script with heavy thematic undertones, holds up completely as its own work of art divorced from the source material." Brian Ashcraft of Kotaku said "The First Attack on Titan Movie Stinks". Piera Chen of The Hollywood Reporter called the film "a visually refreshing blockbuster undermined by clichés." Derek Elley of Film Business Asia gave it a 7 out of 10 rating and called it "a trash-horror fantasy that's a big-budget B picture." SFX artist Yoshihiro Nishimura and director Shinji Higuchi responded to some critics, with Nishimura responding to unfavourable comparisons of the film's special effects with Hollywood's standards thus: "I'm sorry, but deciding what movies to see based on their budget, and comparing everything to Hollywood, that's like how some people feel secure buying Okame natto when they go to the supermarket". Higuchi referenced one critic of the film's characters, saying "who's the idiot who gave this guy an early release of the film?!" On Rotten Tomatoes, Attack on Titan: Part 1 received a 58% approval rating based on 12 reviews, with an average rating of 6.5/10. Part 2 received a 57% approval rating based on 7 reviews, with an average rating of 6/10. Attack on Titan: Part 1 received criticism from San Francisco, Ohio, Kentucky, and Wisconsin theater attendees due to a subtitle ("I've been waiting for this day!") freezing in the first ten minutes of the film and continued to stay frozen for a majority of the film due to a software problem. As a consequence, Funimation announced that they would hardsub Part 2 and all future releases. However, others have reported the subtitles working properly in other states. Funimation has reported that fewer than 2% of theaters have been affected by the freeze. In January 2017, it was reported that Warner Bros. was in negotiations to secure the film rights to the Attack on Titan franchise. Fantastic Beasts and Where to Find Them producer David Heyman would be on board to produce a proposed two-film project that would remake the 2015 Japanese live-action film adaptations. However, the following day, a Kodansha representative denied this report to be true, but said there were other projects in negotiations. In October of the same year, Warner Bros. finalized a deal with Kodansha, as well as announcing Andy Muschietti to direct, with Heyman, Masi Oka, and Barbara Muschietii (the director's sister) to produce. ^ a b c d e Elley, Derek (19 August 2015). "Attack on Titan". Film Business Asia. Retrieved 22 August 2015. ^ a b Chen, Piera (20 August 2015). "'Attack on Titan' ('Shingeki no Kyojin'): Film Review". The Hollywood Reporter. Retrieved 23 August 2015. ^ "ATTACK ON TITAN THE MOVIE: PART 1 (15)". British Board of Film Classification. 24 November 2015. Retrieved 24 November 2015. ^ "ATTACK ON TITAN THE MOVIE: PART 2 (15)". British Board of Film Classification. 30 November 2015. Retrieved 30 November 2015. ^ a b "Godzilla Resurgence Press Notes". Scifi Japan. 13 June 2016. Retrieved 13 June 2016. ^ "Attack on Titan: Part 1". Box Office Mojo. Retrieved 15 July 2016. ^ "Attack on Titan: Part 2". Box Office Mojo. Retrieved 15 July 2016. ^ a b Mark Schilling (3 August 2015). "Japan Box Office: 'Attack On Titan' Devours Top Spot". variety.com. Retrieved 2 August 2015. ^ a b "Live-Action Attack on Titan Confirmed for 2 Films". Anime News Network. Retrieved 1 July 2015. 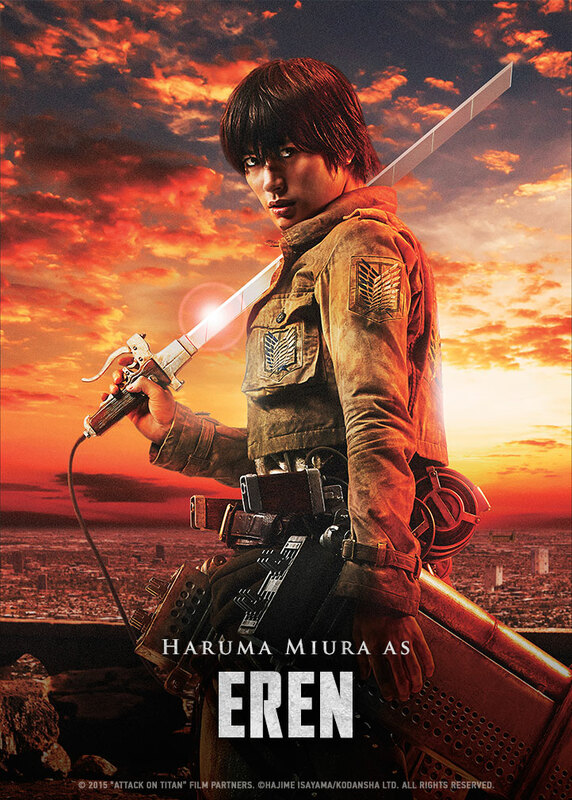 ^ "Official English Poster – About Eren". attackontitanthemovie.com. Retrieved 11 February 2018. 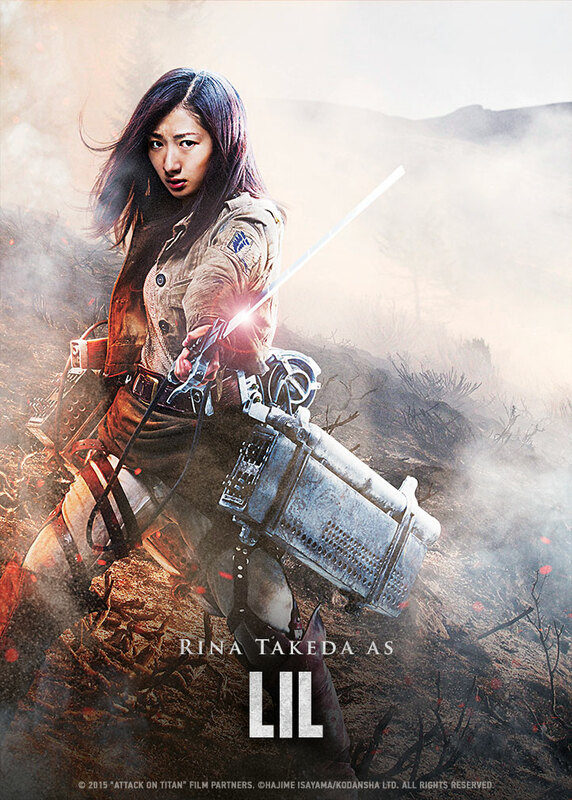 ^ "Official English Poster – About Mikasa". attackontitanthemovie.com. Retrieved 11 February 2018. ^ "Official English Poster – About Shikishima". attackontitanthemovie.com. Retrieved 11 February 2018. 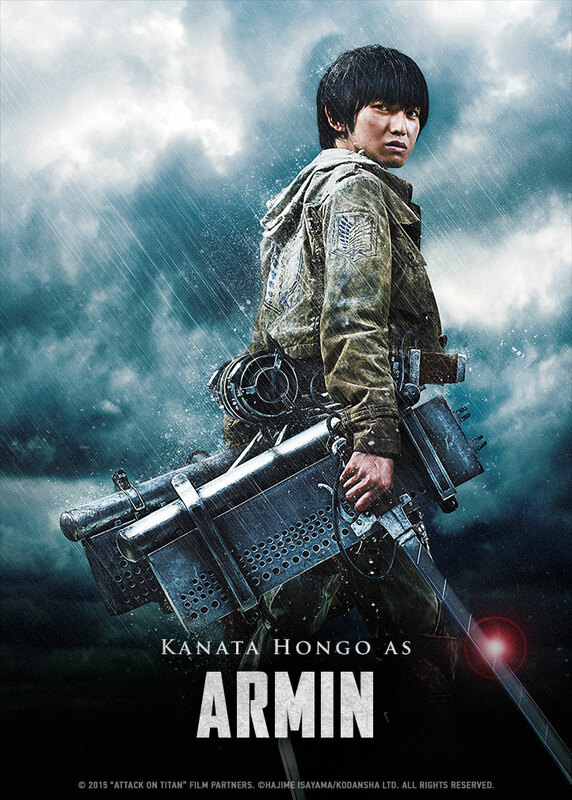 ^ "Official English Poster – Armin". attackontitanthemovie.com. Retrieved 11 February 2018. ^ "Official English Poster". attackontitanthemovie.com. Retrieved 11 February 2018. 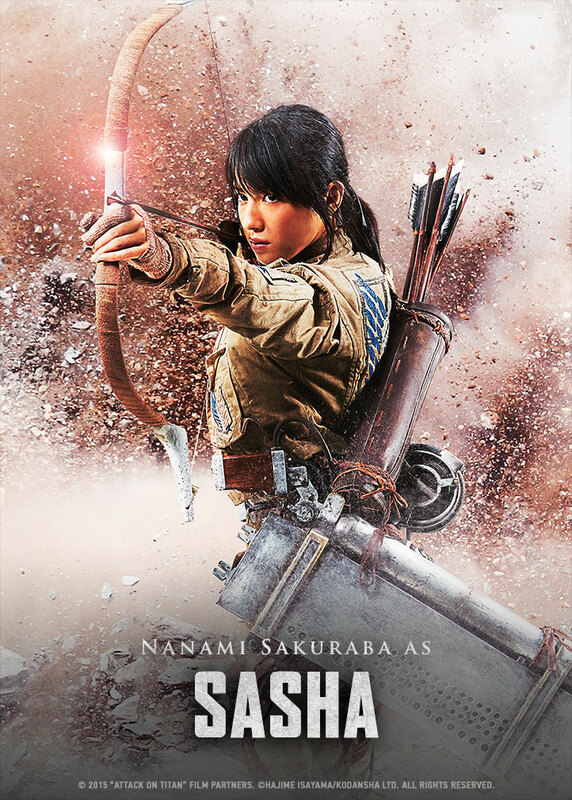 ^ "Official English Poster – Sasha". attackontitanthemovie.com. Retrieved 11 February 2018. ^ "Official English Poster – Sannagi". attackontitanthemovie.com. Retrieved 11 February 2018. ^ "Official English Poster – Fukushi". attackontitanthemovie.com. Retrieved 11 February 2018. 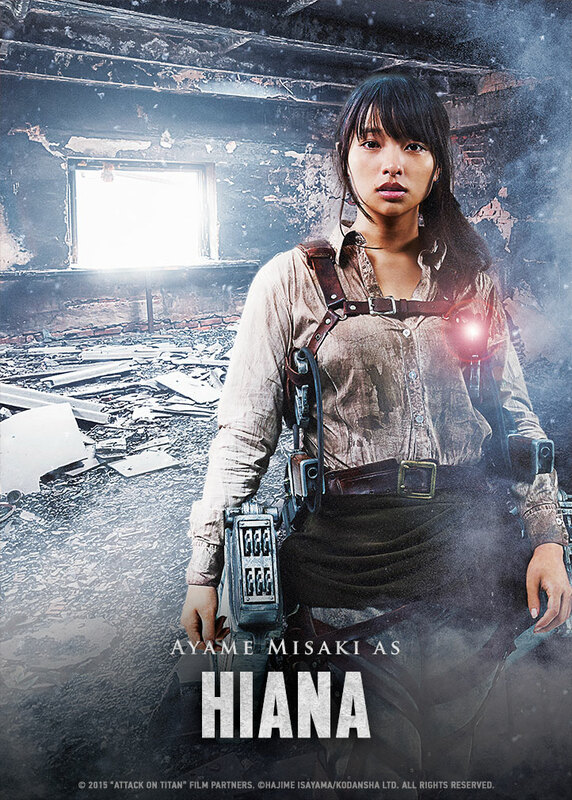 ^ "Official English Poster – Hiana". attackontitanthemovie.com. Retrieved 11 February 2018. ^ "Official English Poster – Lil". attackontitanthemovie.com. Retrieved 11 February 2018. 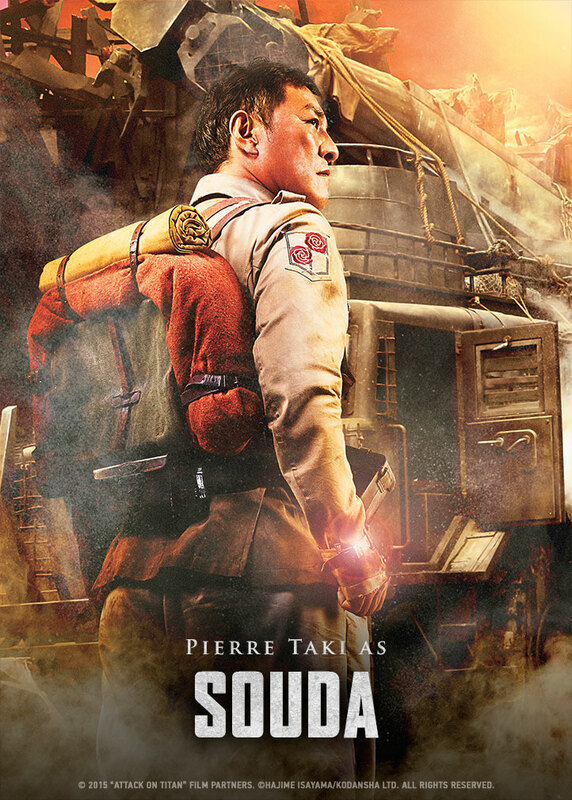 ^ "Official English Poster – Souda". attackontitanthemovie.com. Retrieved 11 February 2018. 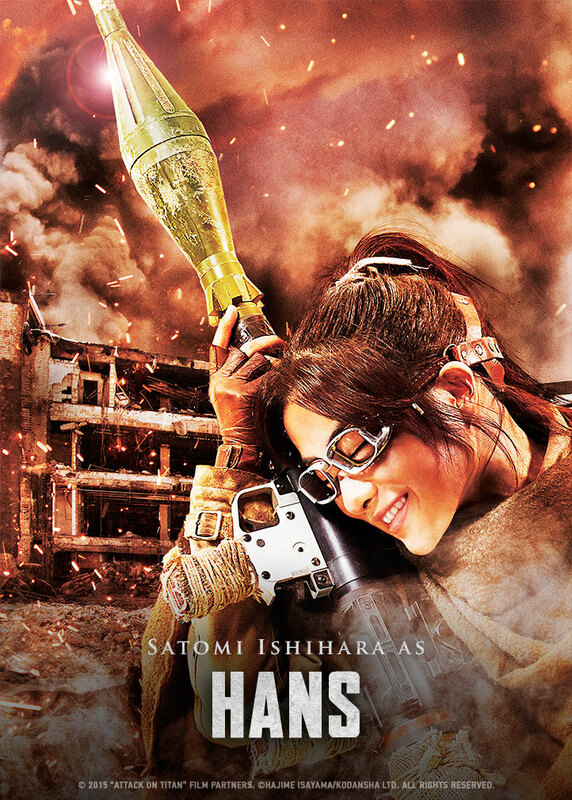 ^ "Official English Poster – Hans". attackontitanthemovie.com. Retrieved 11 February 2018. ^ "Official English Poster – Kubal". attackontitanthemovie.com. Retrieved 11 February 2018. ^ "実写版『進撃の巨人』、主人公のキャラ変更は原作者の要望…脚本・町山智浩が激白！" [Live-action version of "Attack on Titan", a character change of a hero by the Author ... screenplay, Tomohiro Machiyama is great!] (in Japanese). 22 July 2015. Archived from the original on 22 July 2015. Retrieved 29 July 2015. ^ Martinez, Phillip. "'Attack On Titan' Live-Action Movie Removed Levi Because He's Not Japanese". iDigitalTimes. IBT Media Inc. Retrieved 29 July 2015. ^ Keating, Lauren (23 July 2015). "The Real Reason Why The 'Attack On Titan' Movie Is Missing The Most Popular Character". Tech Times. TECHTIMES.com. Retrieved 29 July 2015. ^ "Shingeki no Kyojin/Attack on Titan Manga to Get Film in Fall 2013". Anime News Network. 12 October 2011. Retrieved 12 June 2015. ^ "Attack on Titan/Shingeki no Kyojin Film to Be Live-Action". Anime News Network. 6 December 2011. Retrieved 12 June 2015. ^ "Kamikaze Girls/Confessions' Nakashima Confirmed for Attack on Titan". Anime News Network. 7 December 2011. Retrieved 12 June 2015. ^ "Director Nakashima Leaves Live-Action Attack on Titan Film". Anime News Network. 13 December 2012. Retrieved 12 June 2015. ^ "SFX Director Shinji Higuchi to Helm Live-Action Attack on Titan Film". Anime News Network. 3 December 2013. Retrieved 12 June 2015. ^ "Live-Action Attack on Titan/Subaru Forester Collaboration Ad Aired". Anime News Network. 24 January 2014. Retrieved 12 June 2015. ^ "Live-Action Attack on Titan Ad Played Over 6 Million Times". Anime News Network. 27 January 2014. Retrieved 12 June 2015. ^ "Haruma Miura Stars in Live-Action Attack on Titan Film". Anime News Network. 2 April 2014. Retrieved 12 June 2015. ^ "Live-Action Attack on Titan Confirmed for 2 Films". Anime News Network. 29 July 2014. Retrieved 12 June 2015. ^ "Live-Action Attack on Titan Films' Eren, Mikasa, 11 Others Unveiled in Costume (Update)". Anime News Network. 19 November 2014. Retrieved 12 June 2015. ^ "Sekai no Owari to Perform Theme Songs for Live-Action Attack on Titan Films". Anime News Network. 26 May 2015. Retrieved 12 June 2015. ^ "進撃の巨人 ATTACK ON TITAN(2015)". allcinema (in Japanese). Stingray. Retrieved 12 June 2015. ^ "Attack on Titan - In cinemas August 27". Madman Entertainment. 2015. Retrieved 30 August 2015. ^ "Funimation Licenses Live-Action Attack on Titan Films". Anime News Network. Retrieved 29 June 2015. ^ "VIDEO: FUNimation Announces Screening Dates For "Attack On Titan" Live-Action Films". Crunchyroll. 2015-08-14. Retrieved 2015-09-18. ^ "進撃の巨人 ATTACK ON TITAN エンド オブ ザ ワールド(2015)". allcinema (in Japanese). Stingray. Retrieved 12 June 2015. ^ "ATTACK ON TITAN PART 2: END OF THE WORLD – In Cinemas, Australia & New Zealand October 1 – 7 – Tickets On-Sale Now". Madman Entertainment. 2015-08-28. Retrieved 2015-09-18. ^ Barder, Ollie (25 September 2015). "'Attack On Titan' Movie Sequel Slumps At The Japanese Box Office". Forbes. Retrieved 7 December 2018. ^ "Attack on Titan The Movie: Part 1 on Blu-ray and DVD from Funimation in October". Scifi Japan. 14 September 2016. Retrieved 8 October 2016. ^ "Attack on Titan The Movie: Part 2 on Blu-ray and DVD from Funimation in December". Scifi Japan. 3 November 2016. Retrieved 2 November 2016. ^ "Live-Action Attack on Titan Films' Full Teaser Reveals Opening Dates". Anime News Network. 20 March 2015. Retrieved 12 June 2015. ^ "Attack on Titan Live-Action Film's New Trailer Previews Colossal Titan". Anime News Network. 17 April 2015. Retrieved 12 June 2015. ^ "New Trailer for Live-Action Attack on Titan Movie Teases First Look at Three Dimensional Manoeuvre Gear". Final Reel. 23 June 2015. ^ "Attack on Titan Part 1: The IMAX Experience". IMAX. Retrieved 2015-09-18. ^ "The Attack on Titan Part 2: The IMAX Experience". IMAX. Retrieved 2015-09-18. ^ Barder, Ollie (4 August 2015). "First 'Attack On Titan' Movie Tops The Japanese Box Office". Forbes. Retrieved 5 August 2015. ^ "Top 10 Grossing Domestic Japanese Films of 2015 Listed". Anime News Network. 1 January 2016. Retrieved 1 January 2016. ^ "Japan Yearly Box Office 2015". Boxofficemojo. 22 April 2016. Retrieved 22 April 2016. ^ "Crunchyroll - "Bakuman." Live-Action Film Tops Japan's Weekend Box Office with 251 Million Yen". Crunchyroll. Retrieved 8 October 2015. ^ Lee, Edmund (2014-05-22). "Film review: live-action Attack on Titan — a supersized zombie flick". South China Morning Post. Retrieved 2015-09-18. ^ Chapman, Jacob Hope (27 February 2016). "Attack on Titan: Part I (Live-Action Movie) - Review". Anime News Network. Retrieved 11 August 2015. ^ Ashcraft, Brian (3 August 2015). "The First Attack on Titan Movie Stinks". Kotaku. Retrieved 5 August 2015. ^ Hawkes, Rebecca (3 August 2015). "'You should watch movies that have been hit in the face with stacks of cash': Attack on Titan filmmakers blast critics". Telegraph. Telegraph Media Group Limited. Retrieved 5 August 2015. ^ "Attack on Titan: Part 1 (Shingeki no kyojin) (2015)". Rotten Tomatoes. Fandango. Retrieved 20 April 2018. ^ "Attack On Titan: Part 2 (Shingeki no kyojin endo obu za warudo) (2015)". Rotten Tomatoes. Fandango. Retrieved 20 April 2018. ^ Ashcraft, Brian (1 October 2015). "The Attack on Titan Subtitle Disaster". Kotaku. Retrieved 1 October 2015. ^ Anime News Network (1 October 2015). "Fans Report English Subtitle Issues for Attack on Titan Live-Action Film". Anime News Network. Retrieved 1 October 2015. ^ "Deadline: Warner Bros. In Negotiations for Western Attack on Titan Films". Anime News Network. 17 January 2017. Retrieved 17 January 2017. ^ "Kodansha Rep: Report of Warner Bros.' Attack on Titan Films Is 'Incorrect'". animenewsnetwork.com. Retrieved 11 February 2018. ^ McNary, Dave. "Andy Muschietti to Direct 'Attack on Titan' for Warner Bros. (EXCLUSIVE)". Variety. Retrieved 1 November 2018.